I have been a military dependent all my life and have always enjoyed the benefits of shopping at the commissary. (Commissaries are supermarkets located on military installations that sell food, sundry and cleaning products for cost plus a five percent surcharge to military and retirees.) The prices there are so low that even buying groceries at Wal-mart can be a splurge, Costco is not worth the membership fee, and local grocery stores are good only for the few items I need in between the big commissary trips. Therefore, I have never had to mess with coupons. I did anyway, though – I would go through the Sunday inserts and clip whatever looked interesting and use them when I needed them. I figured if I could clip and use a coupon or two, that would pay for the Sunday paper. Again, no real necessity. As the military moved us from place to place, and I started wanting to live away from the base to experience the locality, I began to take notice of the local grocery store circulars. Some places had buy-one-get-one-free (BOGO) offers and some doubled coupons. The commissary doesn’t do this. I began studying the circulars and buying what was on sale, using coupons if I had them. But again, it was more for the bargain hunter in me than anything else. I still had the commissary and never had to rely on “outside” prices. Last year, my husband got an interesting assignment. He was accepted in the Air Force Fellowes program and was to work for a civilian corporation for one year, to see how the “the other side” operated. We transferred to CT, far away from any military base, military families, and military life. There was one grocery store in town and although it was a nice one, it had no competition and was quite expensive. Our first night in town, we stopped to pick up a few things, and I nearly choked. I knew I was going to have to figure something out to afford groceries for my family. I no longer buy what I need right now. It’s hard to get used to, but you have to buy items when they go on sale and when you have coupons. So if toothpaste is on sale and you have coupons, you need to buy six week’s worth for your family. I say six weeks because that’s the approximate time between sales. So even though you don’t need toothpaste today, if your family goes through eight tubes of toothpaste in six weeks, if it’s on sale and you have the coupons, you buy eight tubes today. You will never again buy a tube of toothpaste at full price – this is the insider secret, the ultimate goal, the prize. I buy $2.99 Edge Shaving Gel for $1. I bought coffee today for $1, combining the store’s coupon I picked up a few weeks ago with its sale today along with a manufacturing coupon. I have plenty of coffee and shaving cream, so I bought these things when the price was right, not when I needed them. The same goes for shampoo, soup, cereal, toilet paper, sodas, canned goods – every nonperishable item on your list. But you also need to have a place to store these items, and you will soon have what is known as a stockpile. But first, where do you get these coupons? The Sunday paper, of course, but the internet is also a goldmine. http://www.coupons.com is a great place to start. After you get started you will find more and more places to get coupons. How far each person goes with this is up to them. Second, how much to buy? You see on Extreme Couponing people who buy years’ worth of products. That is not for me. One, my stockpile is a modest armoire that can hide my goods. I am a neat freak and do not want to look at boxes of Ziplock bags all day long. I am not willing to dedicate any more space than my armoire, and there is no way my husband would give up his garage. I buy what I need for my family to use for six weeks. 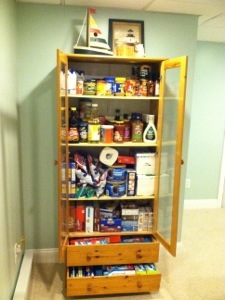 There is a fine line between stockpiling for your family and hoarding, between taking what you need and being greedy. Again, these lines and how far a person goes with this is up to them. Next, how much time do I need to spend each week? At first you will spend a lot of time as you begin to collect, print, clip and sort coupons. You’ll need a system. 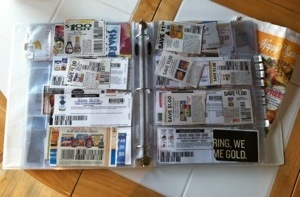 I found my coupon wallet system did not work anymore because thumbing through the stacks was too time-consuming – I needed to be able to see each coupon at a glance – so I bought an inexpensive 3-ring binder from Wal-mart and bought coupon sleeves, also inexpensively, off Amazon. You will need to figure out your categories, and you can get some good ideas just by searching for “coupon categories” on the internet. At first you might do like I did and clip every single coupon out there, only to find that your store doesn’t carry that item, or your kids are sick of that cereal, or you really don’t use Band-Aids anymore. So, in the beginning, be prepared to dedicate a lot of time as you would any new interest. OK, I’ve got my coupons organized – how do I start saving? Start with your grocery store’s circular. Note what costly items are on sale. That is what your family will eat this week. Then go through the items and circle what you have coupons for. Buy as much as your system will allow. And start stockpiling. Keep weeding out the expired coupons, keep collecting coupons (I do it on a weekly basis), and get in the groove. Then, the first time someone in your family says, “We’re out of syrup,” instead of getting that sinking feeling that syrup is so expensive and you hadn’t planned on going to the grocery store today, remember that you have six bottles you purchased at half price and tell them to go grab one. This entry was posted in Education (Home and Life) and tagged Coupons, grocery store, library, military. Bookmark the permalink.